This little item comes to us from the ever popular Newsbusters. They always have good stuff and Brent Bozell is doing the Lord's work. Jamil el-Banna, 45, was one of three British residents arrested after landing back in the country last night following their release from the controversial US military prison on Cuba. Appearing at City of Westminster Magistrates' Court today, el-Banna was granted bail of £50,000 by Senior District Judge Timothy Workman, despite prosecution arguments that he was highly likely to abscond. 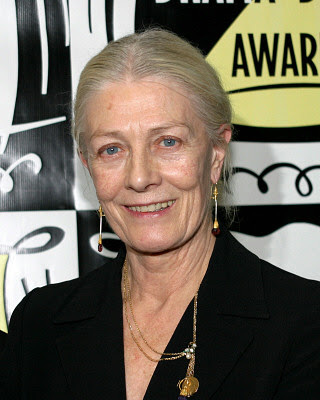 The actress and human rights activist Vanessa Redgrave was named as one of the possible suretors in court. Interviewed outside, she declined to be specific about her financial involvement but said she was "very happy" to be of "some small assistance for Jamil and his wife". "It is a profound honour and I am glad to be alive to be able to do this," she said. "Guantanamo Bay is a concentration camp." Well I imagine it's not a very comfortable place. It's a prison for enemy combatants. But "concentration camp" is an explosive term, evoking images of Auschwitz or the Gulag where tens of millions died, many gassed or starved to death, assuming they weren't first lined up against the wall, shot and tossed into pits. No one, to my knowledge, has been murdered in Guantanamo. Difficult jurisdictional questions have arisen with legitimate human rights questions asked. There have been a few reported suicides, though I am not sure how well documented. But starvation has not been a problem. According to many reports, the detainees have never eaten so well (four meals a day) and obesity might be more of an issue. Of course, there was that report in Newsweek a couple of years back that, to punish an unruly inmate, a US military guard had flushed a Koran down the toilet. Only it was then discovered that there weren't flush toilets, only chemical toilets, at Guantanamo, so such an act was physically impossible. Vanessa probably missed the retraction in Newsweek. And I salute you and I pay tribute to you and I think you should be very proud that in the last few weeks you've stood firm and you have refused to be intimidated by the threats of a small bunch of Zionist hoodlums [gasps from the audience followed by a smattering of boos and clapping] whose behavior is an insult to the stature of Jews all over the world and to their great and heroic record of struggle against fascism and oppression. And I salute that record and I salute all of you for having stood firm and dealt a final blow against that period when Nixon and McCarthy launched a worldwide witch-hunt against those who tried to express in their lives and their work the truth that they believe in [some boos and hissing]. I salute you and I thank you and I pledge to you that I will continue to fight against anti-Semitism and fascism." Yeah, I am certain you will "continue to fight against anti-Semitism and fascism" by making movies for the Lifetime Movie Channel and giving your money to Islamofascists who would line you up against a wall and shoot you. Before I get on to the writing awards, there's a little matter I'd like to tidy up - at least if I expect to live with myself tomorrow morning. I would like to say, personal opinion, of course, that I'm sick and tired of people exploiting the Academy Awards [loud applause] for the propagation of their own personal propaganda. I would go further to say that the Hollyweird elite, who, with few exceptions, are the greatest oxygen thieves in the history of mankind, are little more than tiny blips on the radar screen of life. I mean, when your job is to pretend to be something, I think you are not qualified to do anything of meaning. Has anyone else not missed the TV writers? For her continued support of filthy Wahhabi sheep sodomizers, Vanessa Redgrave STFU!